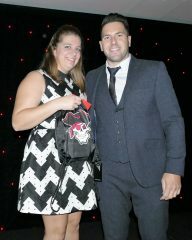 Over 70 players, coaches, staff and family members from the East Kilbride Pirates senior and women’s teams gathered at the Village Hotel in Glasgow in October for the club’s 2017 Player of the Year awards night. 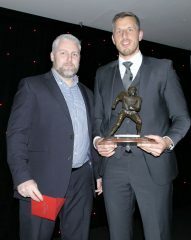 The evening culminated with veteran wide receiver Kenny Muir being named as senior team Player of the Year in recognition of his outstanding performance over the last season. Kenny was also recognised by his team mates too, who voted for him to receive the Rob Worboys Players’ Player of Year award. For the first time the night also saw the inclusion of awards for the Pirates women’s team, who celebrated their achievements for their contact football season earlier this year. Read our all time awards list for information on previous senior and women’s team winners.